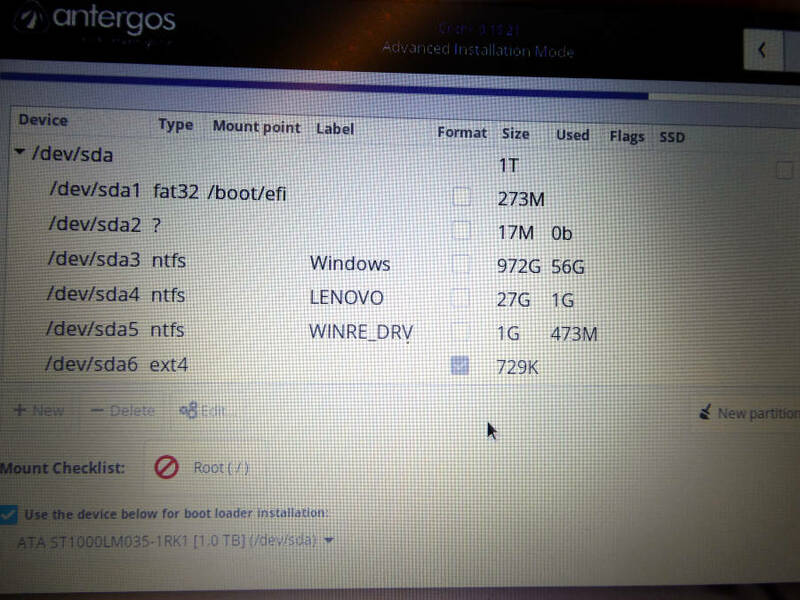 I’m trying to install Antergos on a Lenovo Ideapad 320 (AMD A9-9420, Radeon R5 & 8 GB Ram, 1 T HD). So far I’ve always installed only Linux on my laptops, but as this one has a quite big hd I’d like to have a dual boot Windows/Linux machine. Antergos live seems to be working fine (and this is actually the reason I’m trying it, instead of Manjaro as in my previous laptop), however as I wrote I can’t go beyond the partitioning stage. I do (try to) follow the instructions found on the antergos wiki for dual booth with Windows. And then I can’t go any further, as “+ New” stays gray whatever I try, and I don’t know what to do next. What if I use gparted on the live to create a big free space and then modify/create the root, swap and home partition with Cnchi? Or there somewhere a more detailed tutorial for the not so bright linux users? If you use Gparted, like you suggested, create a root, home and swap partition with it. The only thing you have to do in Cnchi then, is select a partiton and click on the box with the red sign to assign it as root and do so with home and swap. @Bryanpwo thanks for the reply! I’ll try that, however another issue I had was that this box with the red sign seemed unresponsive (but possibly I haven’t done it the right way…). @Bryanpwo but wasn’t 20 GB enough (from the wiki article)? Anyway, I’ll try again with 30. @robgriff444 thanks, I’ll try that too. 20 GB is large enough, but once you get into Arch, you’ll thank me for the extra space I suggested. @Finrod TBH I struggled a bit with it when I first did it but my mind ‘clicked’ once I had done it right, it will even add a ‘button’ to says swap is ok if you add it! Thanks, I was merely aiming at the fact that Arch users are more likely tempted to tinker with their systems or even have more than one DE installed alongside. 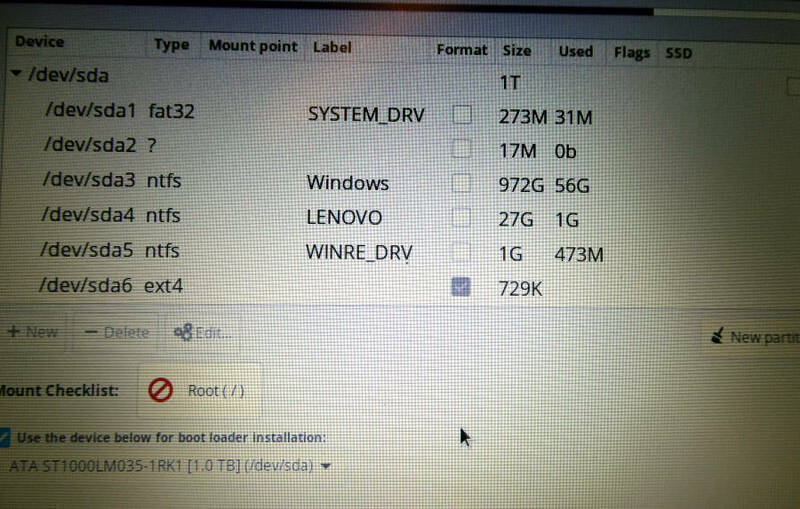 @Finrod you can not “click” 20Gb to create 20GB partition out of a 729K partition… yoiú will need to shrink one of your ntfs partitions first to free space on the drive, you can do this with gparted, reboot and try again, but first take care that the drive is clean und defragented from windows. I’d rather do the partition with gparted, I’m actually not much familiar with Windows, as I used Mac OS before moving to Linux a few years ago. @Finrod He means to defrag the drive first (if it needs it) in windows so that when you resize it you don’t run into any problems or the resize takes longer than it should.